Now you have chosen your cubicle brackets and headrail, you can look to choose your hinges and leg supports. At this point you will have everything you need to assemble your cubicles. But before you look to order these fittings, is also worth considering the height in which you’d like the partitions as cubicle legs are available in a variety of heights. The first thing to establish when searching for cubicle hinges is the direction in which your cubicle door opens, as from this you will determine the handing you require. If you are looking at your door from a birds-eye view and the door opens clockwise you will require right-handed hinges. If it opens anticlockwise however, you will need left-handed hinges. It is also important to consider the thickness of the board and overall weight of your door, to ensure that there is enough support to stabilise movement between the door and the pilaster. It is advisable to speak with your supplier to clarify the best product for your requirements, if necessary. Most commonly used are gravity and sprung hinges and it is worth considering both to determine which will be most beneficial for your cubicles. Gravity hinges can be set to fall open or closed (as required) when the cubicle is unoccupied so that the cubicles can either appear open to indicate when the cubicle is out of use, or closed for a tidy and streamline finish. Sprung hinges will also prompt the door to resume a closed position, but the tension on these is adjustable to enable a more bespoke closing speed. When fitting heavier doors, it is also worth noting that a sprung hinge pair should be fitted in conjunction with a single (companion) unsprung hinge in the centre to add support and ensure a smooth and steady closing action. 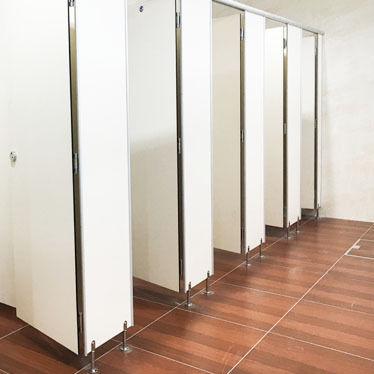 Cubicle legs are a worthwhile investment as they elevate your partition from the floor, therefore providing invaluable protection from wear and tear and enabling the underside of your cubicle to be cleaned thoroughly and high levels of hygiene maintained. Cubicle legs are available in various heights, some of which are adjustable. However perhaps most versatile are the modern short legs, which offer the best compromise in terms of reinforcing your partition, ensuring optimum privacy and easy-clean functionality. Read part 4 'Cubicle Locks and Fittings' the last part of our 4-part blog for information on choosing the best cubicle locks and fittings!